The Rutland County Community Justice Center at BROC Community Action offers a range of services that educate the community and work with offenders, post incarceration, to reduce recidivism through Restorative Justice programming. We serve Rutland City and the surrounding towns of Danby, Fair Haven, ‎Hubbardton, Ira, Killington,‎ Mendon, Middletown Springs,‎ Mount Holly, Mount Tabor, Pawlet,‎ Pittsfield, Pittsford, Poultney, Proctor,‎ Rutland Town, Sherburne, Shrewsbury, Sudbury,‎ Tinmouth,‎ Wallingford, Wells,‎ West Haven, and West Rutland. 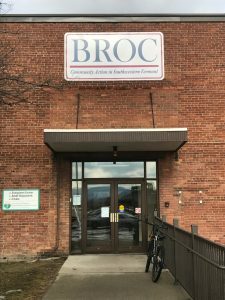 The Rutland County Community Justice Center at BROC Community Action subcontracts Reparative Panels to Rutland County Court Diversion and Restorative Justice Center.